Improve downstream results with better quality control. 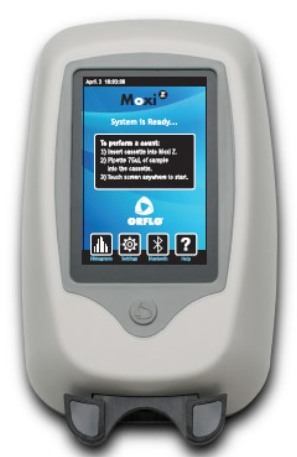 Moxi Z is the only automated cell counter that combines the Coulter Principle typically used in high-end cell counters with a patented thin-film sensor technology to allow for highly accurate (> 95%) and repeatable particle counting and sizing for a broad range of cell types – from mammalian cells to cells as small as wine yeast and more. Since today's workflows demand accurate quality control of samples, determining cell counts precisely has a significant impact on outcomes and downstream costs. Produce repeatable cell counts with >95% accuracy in just 8 seconds. This ultra-small instrument uses patented microfluidic thin-film cassettes that enable automatic load and measure operation. The resulting single cell volumetric measurements are completely technique-independent. It provides the ideal alternative to the tedious manual counting associated with cytometers, or the inaccurate results associated with image-based automated cell counters (typical accuracies of 75-80%). Assess cell culture health without reagents or dyes. Moxi Z also automatically reports a unique cell health assessment index – MPI (Moxi Population Index) – without the need for reagents or dyes. MPI is a ratio of the cell population of interest relative to the entire particle distribution in that sample, factoring in dead cells that have shrunken or broken apart as well as other debris and contaminants in the sample. For monodisperse mammalian cultures this is closely correlated to the overall health of the sample.In the case of mixed cell populations, it's provides an assessment of the relative fraction of the largest sized population in the sample. Unlike staining-based viability methods that focus on the uptake by dead cells and do not account for contaminants and other debris, MPI provides insight on the primary population of interest (based on size) and its relationship to ALL other particles in the sample. Measure the smallest cells at very high concentrations. Using the new Type S cassette, you can now accurately measure the smallest cells of any automated cell counter (down to 3um average diameter) at concentrations of up to 2.5e+6/ml. This means the new Type S cassette can measure Yeast (including wine yeast) and non-spherical particles down to 14 fL in volume. Incredible performance in a small package.